Jerry Wood was called on regularly for cultural and spiritual teachings. From across the wedding dance floor Gisele Wood spied her future husband, a young man from Saddle Lake First Nation, Alta. She asked her school friend who he was. “I asked Norman ‘Who is that guy across the hall?’” Gisele said, explaining that at social events in the 1960s, women sat on one side of the room and men on the other. It was taboo for a woman to ask a man to dance, and so she settled for finding out his name. The friend gave Gisele Jerry Wood’s name, and later in the evening asked if she wanted to dance with him. Almost 50 years later, Gisele is mourning the soft-spoken man who would do anything for her, and who devoted his later years to sharing his knowledge of Cree culture and traditions with thousands of people in Edmonton and the surrounding area. On Dec. 8, Jerry returned to his Edmonton home from giving a presentation to high school students about residential school – which he attended at Blue Quills and Ermineskin for 13 years. “He had survived seven heart attacks and his heart was functioning at 35 per cent,” Gisele explained. Jerry recalled in an earlier Windspeaker interview, that as a young man, he would drink before he went to work, but he hid his penchant for alcohol well. But, during the first day in treatment, Jerry remembered the sexual, physical, mental and spiritual abuse he suffered at residential school. “I realized I was trying to drown all these experiences,” he said. When he stopped drinking, Jerry discovered his Aboriginal heritage, and that it was something to be proud of. He knew he had to search out his roots and learn more about Indigenous spirituality as a key to finding out who he was and what he was meant to do in his life. “And he did begin looking into finding people he could walk a spiritual path with. But they were not Cree. They were Sioux,” explained Gisele. Jerry’s mentor was a Lakota Elder from southern Saskatchewan who invited him to weekly sweatlodge ceremonies, fasts in the wilderness, and guided him through his first Sun Dance. 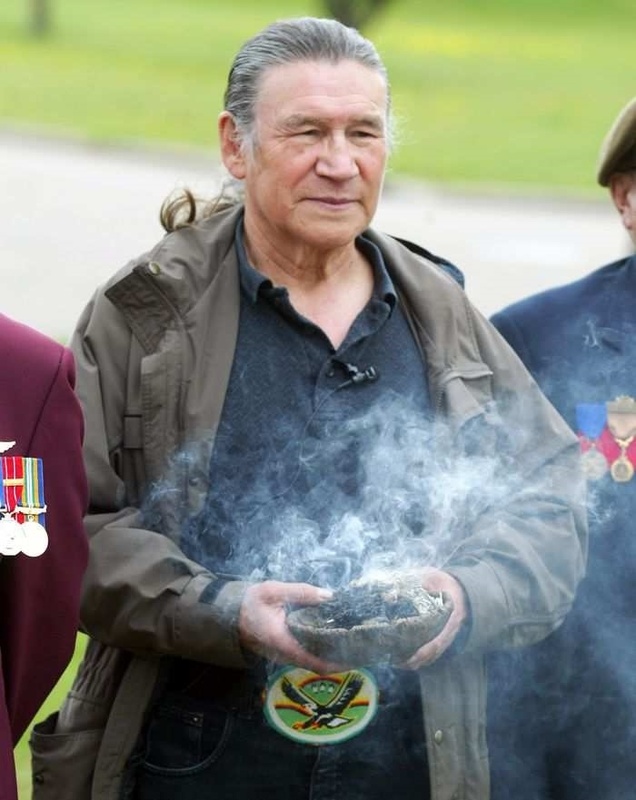 Becoming totally involved, Jerry participated in ceremonies and learned sacred songs until he earned a pipe and the right to lead sweatlodge ceremonies. Always by his side, Gisele, who is French and Montagnais from Quebec, also fasted and Sun danced until, later, she also earned the right to lead sweatlodge ceremonies. She had struggled to find meaning in her Christian faith, and now found her journey to becoming a ceremonial leader more fulfilling than anything she had known. The couple, who raised four children, found themselves working hard to offer ceremonies twice a month, as they chopped wood, gathered rocks and kept the sweatlodge area on a friend’s private land clean. “It was a big commitment. We started our lodge at noon, but we were on-site by 8 a.m. and didn’t get home until the evening. We had to get home, shower, and get to bed early for work the next day. Indeed, after he retired from his boilermaker career in 2002, he and Gisele ran Eagle Spirit Cultural Programs, offering tourists and spiritual seekers tipi camping trips, drum-making workshops and other cultural experiences. Mentored by Saddle Lake Elders, Jerry learned more about his own Cree culture throughout the years. Demand for his teachings grew as Alberta organizations engaged in reconciliation, incorporating Aboriginal traditions into formal events, and dedicating areas of school curriculum to Cree culture and tradition. Among the many organizations Jerry worked with are the University of Alberta, MacEwan University, and Edmonton public and Catholic school districts, for which he served as an Elder. He was also involved in the Truth and Reconciliation Commission, in hospitals, and the military. He supported the Fort Saskatchewan museum, and helped open the reconstruction of Fort Saskatchewan’s mounted police fort in 2011 with a prayer and a song. Due to health problems, Jerry closed his sweatlodge three years ago, but stayed busy as a cultural resource, often attending two to three functions a day. An overwhelming number of friends attended the traditional wake and burial for Jerry. “I can truly say he had a royal send-off. Even in the morgue, staff allowed the Sun Dance chief of Alexis and some drummers to sing songs to help his transition,” Gisele said. Because Jerry taught about treaties and was passionate about upholding Indigenous rights, the Jerry Wood Education Fund will soon be established by the Edmonton Catholic School Foundation. Donations will be used to deliver professional development to educators regarding treaties. For more information, visit www.ecsfoundation.ca.